On August 14, 1983, President Ronald Reagan signed the La Paz Treaty for border environmental cooperation with Mexico (TIAS 10827). The treaty created an international zone over the border creating geographically defined region under management of the Mexican and American EPA agencies. 1983 was also the year of the meeting in Bangkok, Thailand that initiated the Uruguay Round of trade trade talks. With the benefit of hindsight, the positioning towards a common market of the Americas is obvious. Participation in a common market organization the way this was done is a treasonous subversion of national sovereignty. President Bill Clinton, Jiang Zemin, president of the People’s Republic of China; Paul Keating, Prime Minister of Australia; Hassanal Bokiah, Sultan of Brunei who was the world’s richest man (since surpassed by Bill Gates); Canadian Prime Minister Jean Chretien; Indonesian President Suharto; South Korean President Kim Young Sam; Philippines President Fidel Ramos; Japanese Prime Minister Morihiro Hosokawa; New Zealand Prime Minister James Bolger; Singapore Prime Minister Goh Chok Tong; Thailand Prime Minister Chuan Likpahl; and high officials from Taiwan and Hong Kong. The national leaders agreed to upgrade the status of APEC to a ministerial dialogue group for intergovernmental cooperation. The idea was supposedly to “provide greater strategic vision and cooperation for the region”. They also agreed to designate Seattle as the home for APEC in the U.S. The word ‘economies’ is used to describe APEC members because the APEC cooperative process is predominantly concerned with trade and economic issues, with members engaging with one another as economic entities. What they are telling you with that statement is that you no longer have a country. They’ve stolen it by collectivizing the wealth and productivity of the nation into a global communist collective. NCAPEC works to advance U.S. private sector policy priorities in APEC’s discussions on trade and economic issues. NCAPEC also serves as the Secretariat to the U.S. members of the APEC Business Advisory Council (ABAC), the official mechanism for private sector input in APEC. The NAFTA legislation was H.R. 3450, passed by House on November 17, 1993 and by the Senate on November 20, 1993. December 8, 1993 President William J. Clinton signed the North American Free Trade Agreement Implementation Act NAFTA Worker Security Act. It became Public Law 103-182. The Parties to this Agreement, consistent with Article XXIV of the General Agreement on Tariffs and Trade, hereby establish a free trade area. 1 In the event of any inconsistency between this Agreement and the specific trade obligations set out in… such obligations shall prevail to the extent of the inconsistency, provided that where a Party has a choice among equally effective and reasonably available means of complying with such obligations, the Party chooses the alternative that is the least inconsistent with the other provisions of this Agreement. 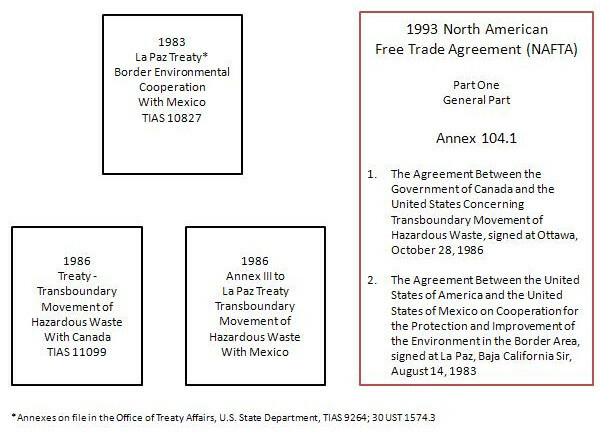 The agreements in Annex 104.1 are the treaties between Canada and the U.S. on transboundary shipments of waste and the La Paz Treaty signed by Ronald Reagan. 1. The Agreement Between the Government of Canada and the Government of the United States of America Concerning the Transboundary Movement of Hazardous Waste, signed at Ottawa, October 28, 1986. 2. The Agreement Between the United States of America and the United Mexican States on Cooperation for the Protection and Improvement of the Environment in the Border Area, signed at La Paz, Baja California Sur, August 14, 1983. Incorporation by reference is the act of including a second document within another document by only mentioning the second document. This is done by attaching the document to the back of the court papers or contract. This act, if properly done, makes the entire second document a part of the main document. So what they did with the NAFTA agreement including two treaties – one with Mexico and one with Canada was to effectively end the United States as a nation-state. It ceased to be a country. It became a territory called North America and it included Mexico and Canada. It was treason by treaty. The La Paz treaty was written as an open framework treaty. It was ostensibly for cooperation with border cleanup but that doesn’t matter. It’s the specific language in the treaty that counts and anything that is environmental can be translated to be economic and vice versa. For the purposes of this Agreement, it shall be understood that the “border area” refers to the area situated 100 kilometers on either side of the inland and maritime boundaries between the Parties. Each Party designates a national coordinator whose principal functions will be to coordinate and monitor implementation of this Agreement, make recommendations to the Parties, and organize the annual meetings referred to in Article 10, and the meetings of the experts referred to in Article 11. Additional responsibilities of the national coordinators may be agreed to in an annex to this Agreement. In the case of the United States of America the national coordinator shall be the Environmental Protection Agency, and in the case of Mexico it shall be the Secretaria de Desarrollo Urbano y Ecologia, through the Subsecretaria de Ecologia. Taking into account the subjects to be examined jointly, the national coordinators may invite, as appropriate, representatives of federal, state and municipal governments to participate in the meetings provided for in this Agreement. By mutual agreement they may also invite representatives of international governmental or non-governmental organizations who may be able to contribute some element of expertise on problems to be solved. The national coordinators will determine by mutual agreement the form and manner of participation of non‐governmental entities. Unless otherwise agreed, each Party shall bear the cost of its participation in the implementation of this Agreement, including the expenses of personnel who participate in any activity undertaken on the basis of it. For the training of personnel, the transfer of equipment and the construction of installations related to the implementation of this Agreement, the Parties may agree on a special modality of financing, taking into account the objectives defined in this Agreement. The present Agreement shall remain in force indefinitely unless one of the Parties notifies the other, through diplomatic channels, of its desire to denounce it, in which case the Agreement will terminate six months after the date of such written notification. Unless otherwise agreed, such termination shall not affect the validity of any arrangements made under this Agreement. In 1994, the APEC summit was held in Bogar, Indonesia. The Bogar Declaration contains the language to require our transportation system to become the domain of international commerce. • to ensure that our people share the benefits of economic growth, improve education and training, link our economies through advances in telecommunications and transportation, and use our resources sustainably. 3. We set our vision for the community of Asia-Pacific economies based on a recognition of the growing interdependence of our economically diverse region, which comprises developed, newly industrializing and developing economies. The Asia-Pacific industrialized economies will provide opportunities for developing economies to increase further their economic growth and their level of development… The narrowing gap in the stages of development among the Asia-Pacific economies will benefit all members and promote the attainment of Asia-Pacific economic progress as a whole. 7. To complement and support this substantial process of liberalization, we decide to expand and accelerate APEC’S trade and investment facilitation programs. This will promote further the flow of goods, services, and capital among APEC economies by eliminating administrative and other impediments to trade and investment. 8. Our objective to intensify development cooperation among the community of Asia-Pacific economies will enable us to develop more effectively the human and natural resources of the AsiaPacific region so as to attain sustainable growth and equitable development of APEC economies, while reducing economic disparities among them, and improving the economic and social well-being of our people. Such efforts will also facilitate the growth of trade and investment in the Asia-Pacific region. Cooperative programs in this area cover expanded human resource development (such as education and training and especially improving management and technical skills), the development of APEC study centers, cooperation in science and technology (including technology transfer), measures aimed at promoting small and medium scale enterprises and steps to improve economic infrastructure, such as energy, transportation, information, telecommunications and tourism, with the aim of contributing to sustainable development. 11. We express our appreciation for the important and thoughtful recommendations contained in the reports of the Eminent Persons Groups and the Pacific Business Forum. The reports will be used as valuable points of reference in formulating policies in the cooperative framework of the community of Asia-Pacific economies. We agree to ask the two groups to continue with their activities to provide the APEC economic leaders with assessments of the progress of APEC and further recommendations for stepping up our cooperation. We also ask the Eminent Persons Group and the Pacific Business Forum to review the interrelationships between APEC and the existing sub-regional arrangements (AFTA, ANZERTA and NAFTA) and to examine possible options to prevent obstacles to each other and to promote consistency in their relations. The legislation was H.R. 5110, passed by the House on November 29, 1994 and by the Senate on December 1, 1994. The law authorized the establishment of the World Trade Organization ending U.S. sovereign authority over our economy beginning January 1995. We must hold Donald Trump to his word.. he not only needs to get us out of NAFTA, he needs to firebomb the entire global system of fascist led communism.